Instagram is a great platform that we use often. You can follow us @wickydesign. 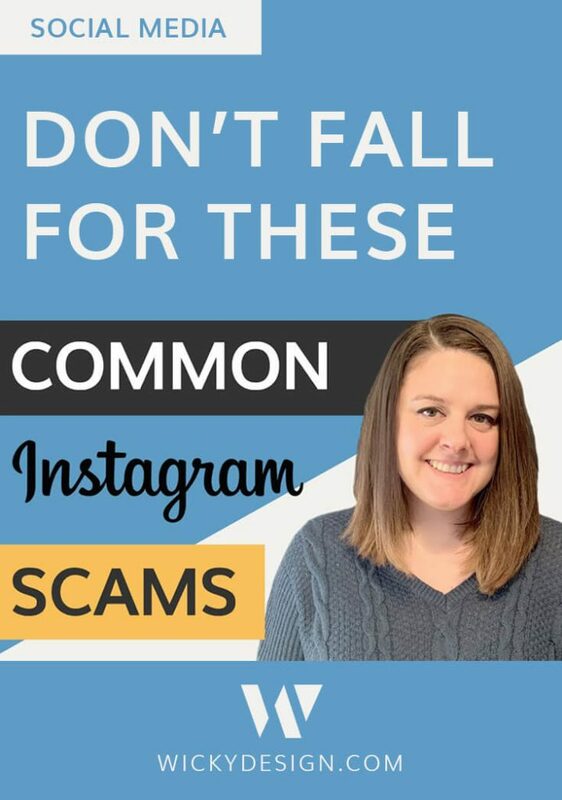 Unfortunately, like many social media platforms, Instagram is filled with scams. Some are easy to spot, others, not so much. So how do you know if a company is legitimate? Let’s get into it. Some Instagram scams are pretty easy to spot. Anything that boasts getting you thousands of followers in minutes or sends you to a link to buy likes or followers is a scam. If you’ve been on Instagram for a while, you have probably seen this. Having a bunch of fake followers that aren’t engaged in your content won’t help your business out at all. Remember, it’s about the quality of your followers, not the quantity! This one is a little trickier to spot as an Instagram scam because sometimes, these are legitimate. People do offer e-books with great information, so it can be hard to distinguish the real people from the scams. The way it works is someone will DM you on Instagram with a link to their free e-book download. The link will look legitimate, but it’s actually a link to a malicious site that can infect your phone. Have you ever interacted with this person on Instagram? If the answer is no, it’s probably a scam that was sent out to thousands of accounts. Check their profile. If they post spammy pictures or captions, it’s likely spam. How many followers do they have? If they have thousands of followers and only posted one picture, they likely bought a bunch of fake followers to look “legitimate”. Huge red flag! Have an e-book to promote? If you legitimately have an e-book that you would like to promote on Instagram, it’s best to get to know your audience before you start DMing links to it. If you engage with your audience, it builds trust. You’ll have a lot more downloads if people actually know who you are and the value that you bring. One Instagram scam I am seeing more frequently is the collaborator scam. I see a lot of people falling for this one because it’s the hardest one to spot as a scam. Brands will reach out to you via DM or email with a flattering message saying that they love your account and want to work with you. They then go on to say they will give you a discount on their products and if you post a picture on your profile wearing it, they’ll repost it to their thousands of followers. Your account will get tons of exposure! Searching for a product that you want to buy with your own money. Taking a picture for Instagram wearing the product. Posting that photo, with a clever caption, and tagging the company on your Instagram account. The company gets your money for the product you bought, free advertisement from you and content for their own Instagram account (if they even repost your photo). That’s the best case scenario because at least you get the product you paid for. In a lot of cases, you’re buying from a completely fake website that doesn’t actually have any products. They take your money and run, without ever sending you the product you paid for. Sometimes, they will even sweeten the deal by saying, “We will give you the product for free, just pay $10 for shipping!” They are making a good living off that $10 scam if thousands of people fall for it! If a legitimate company wants to work with you, you’ll come up with a deal that is mutually beneficial. They will send you products or money in exchange for posts about them. Both parties are required to do something and both parties get benefits from the collaboration. With the rise of Instagram use and influencer marketing being the new, trendy way to make money, scammers are showing up more and more on this platform. Remember, if it sounds too good to be true, it probably is. I hope this post brought some attention to some of the different scams happening on Instagram so you don’t fall victim to them.